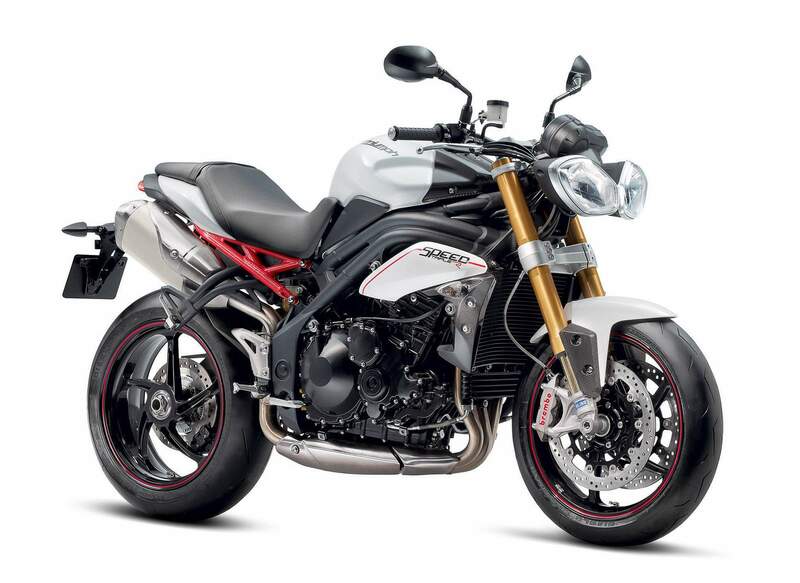 What makes a Speed Triple special? Well, unlike virtually every other naked performance bike, it was conceived from the ground up to be what it is here. No detuning, no decontenting. That may not sound like such a big deal, but the result is a cohesive package in which every component has been created, from the beginning, to emphasize accessible performance over race track success. A motorcycle free to be the ultimate riding machine for the road rather than one being pressed into service away from its natural race track home. But, this new Triumph Speed Triple R adds some very superbike-like components with its top-drawer Ohlins suspension, Brembo brakes and lightweight wheels. Does a road bike really need race-spec components? Maybe somewhat counter intuitively, we went to Jerez to find out. Take the basic performance motorcycle archetype — an aluminum perimeter frame, a powerful engine, tight geometry — and re-conceive it away from what’s needed to win races. Instead of that ultra-peaky inline-four, swap in a torquey three-cylinder engine. Instead of clip-ons and a fairing designed to maximize aerodynamics, swap in low-mounted flat bars and no plastics, emphasizing both comfort at road speeds and control. But, keep the wheelbase short and the suspension steep. Complement that with brutal, minimalist styling. What are you left with? A bike that looks like it wants to punch you in the face. A bike that doesn’t look like it crawled out of the pages of a cheesy superhero comic book. A bike that’s equally at home slicing through urban traffic as it is dragging knee on a mountain road. This model, with its 1050cc motor, was introduced in round headlight form back in 2005. 133bhp, 82lb-ft and 471lbs (wet) wasn’t cutting edge at the time, much less today, but Triumph made up for it with a swollen mid-range, very fast steering and a general feeling of capability far exceeding its paper. All that is backed up by that unique triple growl. Triumph’s R formula is a pretty simple one. Take an already very, very good motorcycle and throw thousands of dollars of the best suspension and brakes there are at it. Cut the buyer a big price break — you’re looking at at least $6,579 worth of upgrades on this Speed Triple R for just a $3,200 premium. Unlike the Street Triple R or 675 R, The Speed gains fancy forged wheels too, massively reducing unsprung weight. All of that is then denoted with classy, understated graphic upgrades. Out goes the classic swoopy Triumph logo and in comes a modern font and subtle red Rs and pin stripes. Some really, really high-quality carbon fiber cosmetic parts — made on the same line as carbon parts for the Audi R8 and Lamborghini Gallardo Superleggera. Triumph doesn’t just order its NIX30 forks and TTX36 shock out of a catalog. Instead, the two items are the product of a bespoke development program run by both the bike maker and Ohlins. Testing is conducted by Triumph’s own test riders, who evaluate a huge number of unique damping rates and spring weights, eventually arriving at a final solution that’s mastered by two identical sets of control suspension. Triumph retains one set and Ohlins another; the function of all production units can then be evaluated against those. Wheels are forged aluminum PVM items that retail, on their own, for $2,980. Unlike cast wheels, forged aluminum isn’t porous, which means it can be machined down to the absolute minimum amount of material while retaining its strength. Wall thickness on the stock, cast wheels is 4.0mm. On these PVMs, it’s just 2.5mm. This reduces weight on the front wheel by .7kg or 16 percent. On the rear it’s 1.0kg or 20 percent. Most of that weight comes out of the rim which, since it’s on the outside extremity of the entire wheel, really helps reduce inertia. Front wheel inertia is reduced by 16 percent; rear by 25 percent. Lower inertia means the wheels resist acceleration less. Lower gyroscopic forces speed steering. Less unsprung weight gives suspension an easier time, enabling it to more effectively keep the tires in contact with the surface, boosting both compliance and grip. Less inertia translates to more powerful braking. 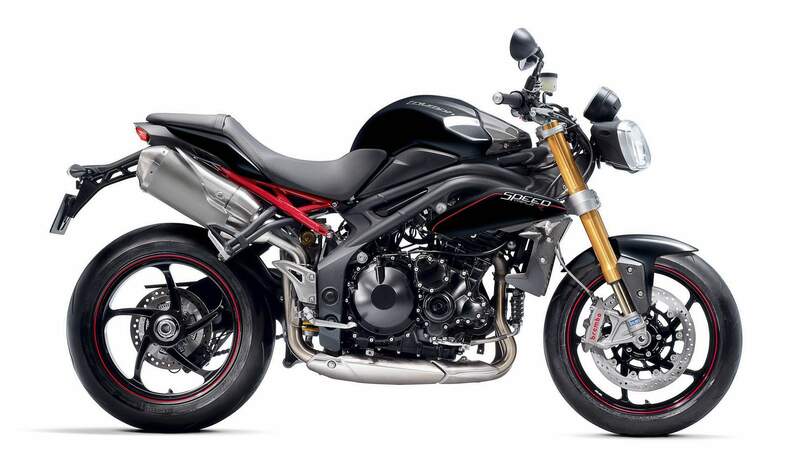 This R also debuts a couple mechanical upgrades that will roll out to the regular Speed Triple in 2013. ABS, which all US models will be equipped with, is now switchable via the instruments. It’s a road-oriented system and Triumph pulled the fuses on all bikes at the launch since we were only riding on track. The gearbox has also been upgrade in the name of slicker shifting, a traditional Triumph bugbear. Gear splines are now formed rather than cut, materials have been strengthened and there’s a new five dog design to replace the old four. That should make shifting more positive and engagement more reliable. 6th gear has also been reduced by 3.4 percent, so should pull stronger than before. Despite the efficacy of the upgrades, it still is an upgraded Speed Triple. One that, at $15,999, prices itself against some very fast competition. For that money you could buy a BMW S1000RR or an Aprilia RSV4 R APRC. A more direct comparison can probably be drawn against the APRC-equipped Aprilia Tuono V4 R. That bike is equipped with inferior components, but has 34bhp more and is $1,000 less. Not to mention the presence of APRC where the Triumph doesn’t even have traction control.